The GET 00086-1-SAN-CL beer mug has a 16-ounce capacity, while its rim-full capacity sits at 17.75 ounces. With a large handle, the mug is easy to grip and tilt. Contents of the glass can easily be seen thanks to the clear construction. The glass will not easily break, chip, or crack since it is made of styrene acrylonitrile. 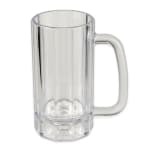 The GET 00086-1-SAN-CL beer mug is 5 inches wide, including the handle, and 6.25 inches tall.